“I Found My Thrill…” — It seems like it was the 50’s the last time the Bruins had a Quarterback as cool as The Fonz, a Coach smarter than Potsie, a Defense tougher than Shortcake, and a Running Back who Produces more than Ron Howard, so smiles are warranted near Hollywood, and you can tell anyone who thinks that UCLA Football had Jumped the Shark to Sit On It! The Bruins are back, so help me Pinky Tuscadero. Joanie may love Chachi, but Bruin fans are loving Jim Mora right now, as well as Brett Hundley and Jonathan Franklin. The Bruins are only 2-0, but they are ranked #22 in the Country, and they are favored by 17 over Houston, who beat the Bruins just last year. The Cougars lost their star QB Case Keenum to graduation, but they still have a potent Offense, and a new QB, who launched a record 77 passes last week without an Interception. UCLA has a history of playing down to their competition, and coming off an emotional upset victory over #16 Nebraska last Saturday, the Bruins are vulnerable to having a serious letdown in this “trap” game. So it will be a test of Coach Mora, to see if he can fire up his team and help them avoid the natural complacency that comes with being a huge Favorite. There are a lot of things to do this weekend for Sports Fans — You can watch the Angels and Dodgers chasing Wild Cards, you can bet on nfl football, or you can come out to the Rose Bowl and root on the Bruins, to make sure this article doesn’t JINX them! I recommend you do all three. 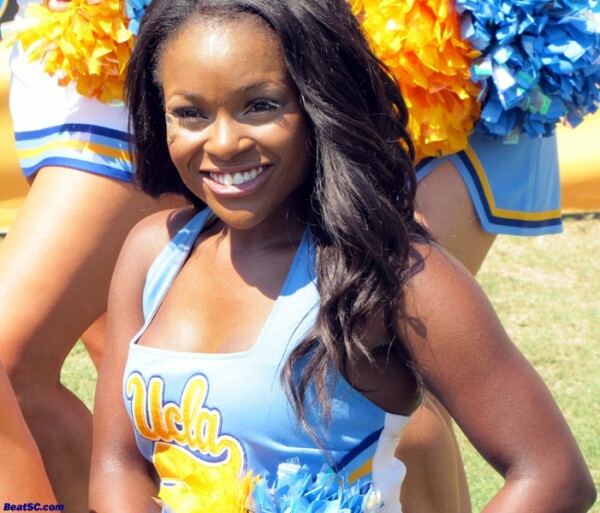 But first, check out these 40 UCLA Cheerleader photos from last Saturday… and look out for 40 more coming in a few hours. "THE HAPPY GAZE OF HAPPY DAYS" was published on September 14th, 2012 and is listed in Blue & Gold News, UCLA/usc/Cheerleader Photos.